A 2-year postdoc is available co-supervised by myself and Dr Darren Evans. 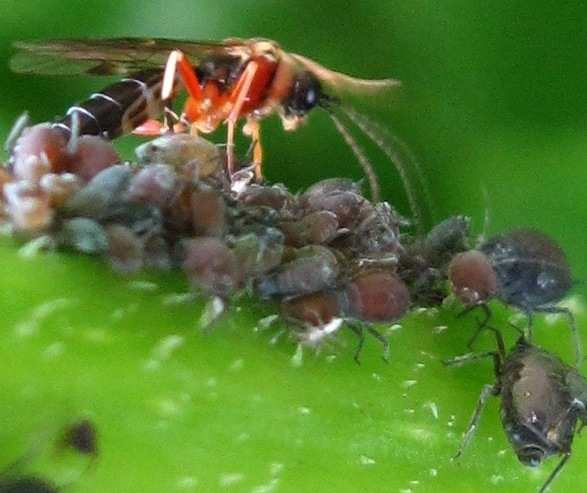 This project will be to use modern DNA techniques to investigate agricultural food webs, focussing especially on the interaction of parasitoid wasps with aphids and leaf miners. We are looking for someone who has proven ability in a molecular lab, with lots of experience of PCR, DNA barcoding, and DNA data analysis. The postdoc, guided by Darren Evans, will establish and maintain replicated field experiments (in collaboration with industrial partners) to examine how climate affects the structure and functioning of aphid-parasitoid and leafminer-parasitoid interaction networks. The postdoc will develop and extend the suite of molecular tools currently deployed to accurately determine parasitism rates and identity. This will provide the highly resolved data necessary for quantitative network construction and analysis. We have successful pilot work using PCR assays of leaf-miner parasitism in wild populations. The postdoc would need to be experienced with sometimes difficult PCR, have an ability to refine and improve our molecular assays and develop the system. We also see having an ‘ecological brain’ as a tremendous asset. Although the work is largely molecular, the system itself is a powerful ecological network design, and a desire to learn these ecological approaches is essential. This is a full time position for a fixed term period of 24 months. The post holder will be strongly encouraged to develop fellowship applications to extend the project and appropriate mentoring will be available. The project will investigate the impacts of climate change on farmland ecological networks. The post holder will use both novel molecular approaches and ecological networks to determine how climate-driven changes affect the ecosystem service of natural biocontrol. With an emphasis on how altered host-parasitoid interactions affect agricultural crop yields, the economic impacts of climate-driven changes will also be determined. The closing date for this position is 13 February 2012.